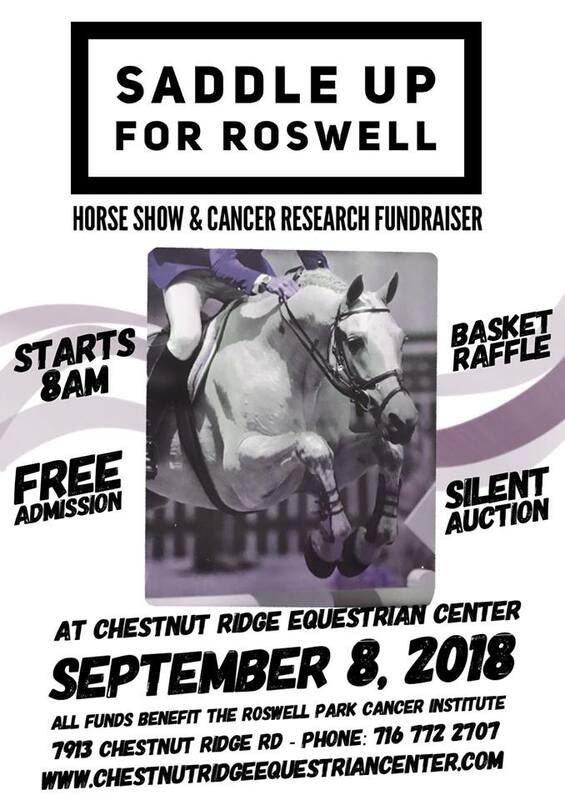 On September 8th, 2018, Chestnut Ridge Equestrian Center will be hosting their 13th annual Saddle Up for Roswell event from 8:00 to 4:00. This is a wonderful horse show where the riders raise money for Roswell. The day benefits cancer research and patient care in Western New York at Roswell park Cancer Institute. More than 110 riders participate in this event and the community is encouraged to come view this great show which will feature dressage, cross country, and stadium jumping events. The Chestnut Ridge Equestrian community is passionate about cancer, a cause that has touched so many in one way or another. They are proud to partner with Roswell Park to assist those who face this disease. Over the history of this event they've raised more than $168,000! In order to continue this special event, they are seeking both in-kind and monetary donations. They also sponsor a basket raffle at the event. Donors would receive exposure on many levels from hundreds of participants, ads in the newspapers, TV spots, links with USEA (United States Eventing Association) and USDF (United States Dressage Foundation). For more information please contact Megan Gamin, Co-Chair of Saddle Up for Roswell, at (716) 772-7703 or pistolmeg@thegamins.com. Roswell Park Cancer Institute, founded in 1898, is the nation’s first cancer research, treatment and education center. The Institute was one of the first cancer centers in the country to be named a National Cancer Institute-designated comprehensive cancer center and remains the only facility with this designation in Upstate New York. RPCI is a member of the prestigious National Comprehensive Cancer Network, an alliance of the nation’s leading cancer centers; maintains affiliate sites; and is a partner in national and international collaborative programs. For more information, visit RPCI’s website at www.roswellpark.org, call 1-877-ASK-RPCI (1-877-275-7724) or e-mail askrpci@roswellpark.org.